I’ve decided that I’m a fan of what Dorie calls “cocktail cookies”…cookies that that tiptoe the edge between sweet and savory. 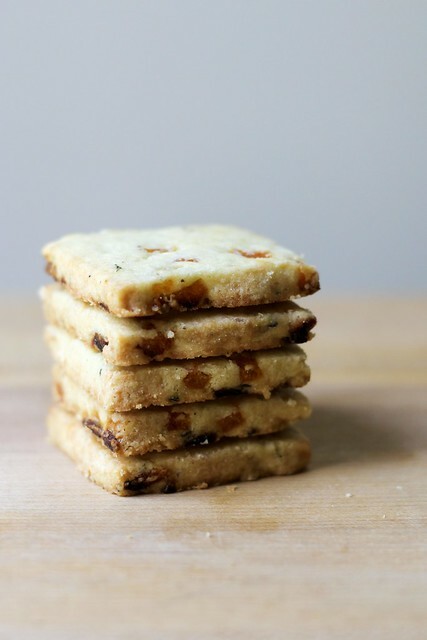 Like these Anytime Lemon Thyme-Apricot Cookies, that are perfect with a glass of white wine or on a cheese plate. They’re a little sweet and a little salty with the texture of good shortbread. Dorie makes them with fresh tarragon in her recipe, but the herb can be swapped around. I went with lemon thyme, which I had on hand, but I’ve seen that a few TWDers used rosemary, too. Come to think of it, the dried fruit can probably also be played with, but the dried Turkish apricots are lovely here. These are roll-out cookies, and you can certainly cut them into rounds. I went with squares so I could bake off the dough in one go, without any re-rolling or wasted scrap. More snacks, less work. That’s my motto. For the recipe, see Dorie’s Cookies by Dorie Greenspan. It’s also here. Don’t forget to check out the rest of the TWD Blogroll. I wish I went with thyme and lemon, I like that combination. Tarragon did not go over well with my crowd. I am taking them to work tomorrow so will see how that goes. The sweet-savory combo is so more-ish!